Some of Sweden's crown jewels have been stolen from a cathedral. Police are chasing the thieves in motorboats after the 'priceless' items were taken from Strängnäs Cathedral in southeastern Sweden this afternoon. Two royal crowns - one belonging to King Karl IX, the other to Queen Kristina - were taken, as well as a royal orb. Two men were seen jumping into a motorboat outside the cathedral, which is about 50 miles from Stockholm, after the theft. The cathedral was open to the public when the jewels were stolen, Aftonbladet reported. Nobody was hurt during the raid. 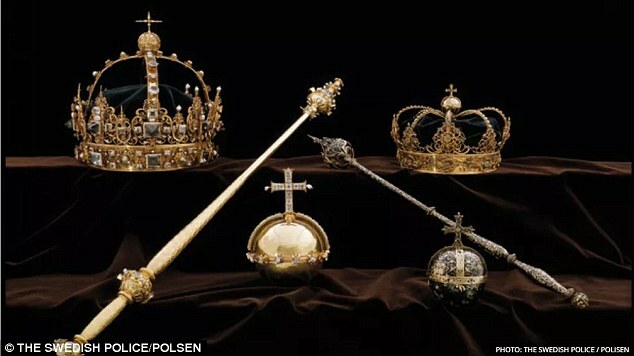 COPENHAGEN, Denmark — A man was charged Thursday with stealing a jeweled crown and two other pieces of Swedish royal treasure from a cathedral where the pieces worth 65 million kronor ($7.2 million) were on display. The objects taken on July 31 during a daring daytime heist - the jeweled crown, another crown and an orb made in 1611 for the funerals of King Karl IX and Queen Kristina - haven't been recovered, national police investigator Filippo Bassini said. "We cannot exclude that the objects have left Sweden," Bassini said. Investigators think two men stole the funeral regalia from Strangnas Cathedral, a red-brick church built between 1291 and 1340 west of Stockholm. The second man was detained but hasn't been charged. The thieves smashed a security case and then fled by motorboat via the vast system of lakes around Strangnas, authorities said at the time. DNA found at the crime scene and on a bicycle used as part of the getaway linked the 22-year-old suspect charged Thursday to the theft, prosecutor Isabelle Bjursten said during a news conference. The suspect, who wasn't named publicly, denied the theft, Bjursten said. A trial date hasn't been announced. Blood was found on an object investigators believe the thieves tried to steal, she said. The display case containing the royal regalia was alarmed. Police said after the theft that the stolen artifacts were of great historic and cultural value, but would be very difficult to sell because of their uniqueness and visibility. While some funeral regalia are kept in the cathedrals of Strangnas, Uppsala and Vasteras, the vast majority of Sweden's crown jewels are in vaults under the Royal Castle in Stockholm. The heist was logged at Interpol, which enables an international search for the missing jewels.